After acquiring all six Infinity Stones in Avengers: Infinity War, the Mad Titan proceeds to achieve his life’s ambition. Thor attempts to stop him with his Stormbreaker axe, of course, and it looks like he succeeds, but Thanos mocks him by saying he should have gone for his head instead. With that, he finally snaps his fingers and, just like that, erases half of all life in the universe. Throughout the battleground, Earth’s Mightiest Heroes start to fall. At first, we see characters like Bucky, Falcon and Wanda disappear before our very eyes. Then, when Black Panther vanishes into thin air, it becomes clear that anyone is up for grabs. Sure enough, back on Titan, we see nearly all of the Guardians turn to dust, except Nebula. Finally, Spider-Man also dies, with the protracted, devastating death scene that one of Marvel’s most popular heroes deserves. By the time that Iron Man’s left standing alone, and the rest of the original Avengers are left in Wakanda, the single most emotionally wrenching moment in a superhero movie ever has just played out. But through the tears and chills, one question remains: how exactly does snapping your fingers, while wearing a fully powered Infinity Gauntlet, make half of all life in the universe disappear? 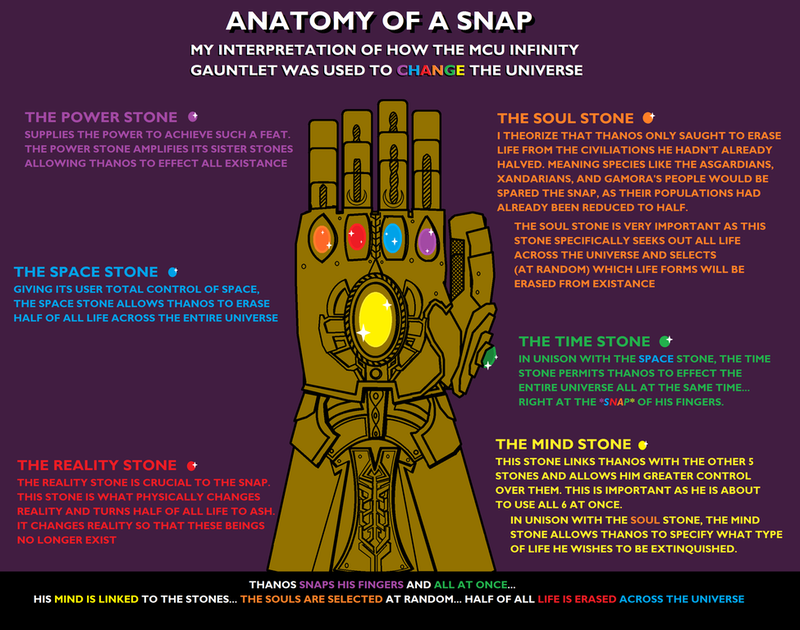 This being a comic book movie, we perhaps shouldn’t think too much about it, but one Reddit user has done exactly that and put together a rather interesting diagram explaining how he believes the Stones work together to enable Thanos to commit such a devastating act. Pretty interesting, right? Of course, Marvel hasn’t really given us any real explanation on the specifics of how the whole thing works, but this definitely seems plausible and is probably the closest we’ll get to understanding it all. In short, it’s good enough for us and we’re happy to accept that this is how the Mad Titan managed to achieve the unthinkable. Then again, if what we’ve heard about Avengers 4 is correct, Thanos may not be able to bask in his glory for long. It’s believed that Earth’s Mightiest Heroes will be using a bit of time travel to right the villain’s wrongs and bring back their friends. How exactly they’ll do that, we don’t know, but hopefully we’ll get some more clues before the film arrives next May.